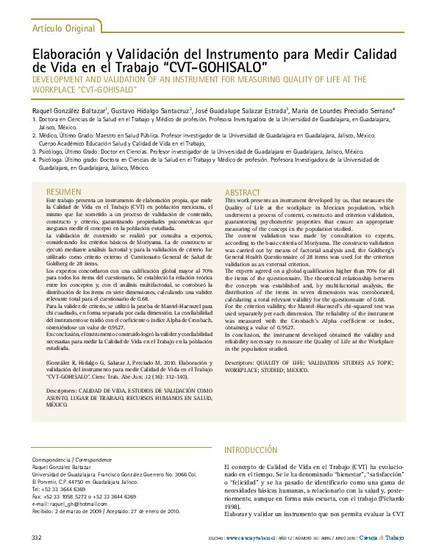 ELABORACIÓN Y VALIDEZ DEL INSTRUMENTO PARA MEDIR CALIDAD DE VIDA EN EL TRABAJO "CVT-GOHISALO"
This work presents an instrument developed by us, that measures the Quality of Life at the workplace in Mexican population, which underwent a process of content, constructo and criterion validation, guaranteeing psychometric properties that ensure an appropriate measuring of the concept in the population studied. The content validation was made by consultation to experts, according to the basic criteria of Moriyama. The constructo validation was carried out by means of factorial analysis and, the Goldberg’s General Health Questionnaire of 28 items was used for the criterion validation as an external criterion. The experts agreed on a global qualification higher than 70% for all the items of the questionnaire. The theoretical relationship between the concepts was established and, by multifactorial analysis, the distribution of the items in seven dimensions was corroborated, calculating a total relevant validity for the questionnaire of 0.68. For the criterion validity, the Mantel-Haenszel’s chi-squared test was used separately per each dimension. The reliability of the instrument was measured with the Cronbach’s Alpha coefficient or index, obtaining a value of 0.9527. In conclusion, the instrument developed obtained the validity and reliability necessary to measure the Quality of Life at the Workplace in the population studied.